Figure A31. East China anomaly, interpreted as the East China slab, with (horizontal) [vertical] cross sections through (A)[D] the UUP07 p-wave) and (B)[D] the combined SL2013 and S40RTS s-wave models at 2170 km; C) the location of the modern geological record that we interpret to have formed during the subduction of the slab. 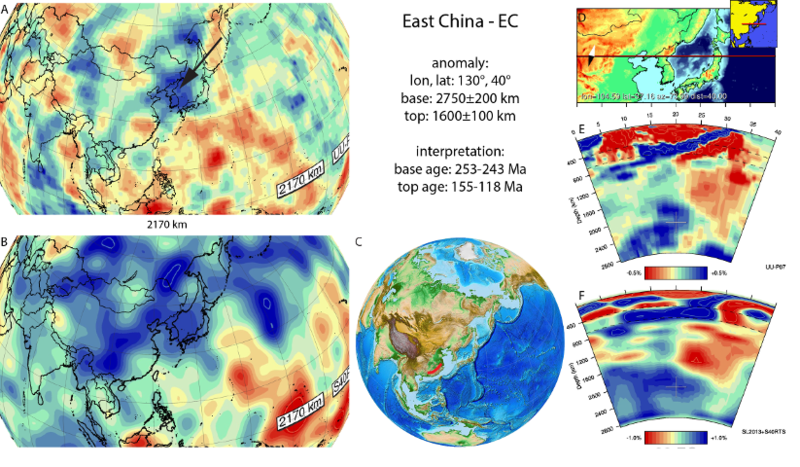 The East China anomaly (Figure A31) is located below eastern Asia from the core mantle boundary up into the deep mantle (~2000 km depth). At its shallowest point (~1700 km), it connects to Mongolia slab to the NW. Due to the thickness of the anomaly slab (>1000km) we tentatively suggest it may comprise multiple SW-NE trending slabs. Van der Voo et al. (1999a) identified this anomaly as a Pacific slab, which formed due to westward subduction of paleo-Pacific (Panthalassa) lithosphere at the east-Asian margin during Mongol-Okhotsk subduction. This suggests that we best correlation the East China slab to a Triassic-Jurassic geological record east of Mongolia. Previously, we correlated the anomaly with the Triassic to Late Jurassic evolution of the Korean peninsula, the North China block, and Japan (van der Meer et al., 2010). Li and Li (2007) described how subduction that started in the Triassic culminated during the Early Jurassic in a flat slab below the South China craton. Foundering of this slab took place between 180-155 Ma. However, Li et al. (2014a) showed that magmatism in South China occurred over a zone of ~600 km wide between 145-118 Ma, which they inferred to be caused by the migration of a subducting ridge. This ridge subduction may be used as timing of slab break-off which we adopt here, although future study into the kinematic history of the Panthalassa-North China subduction history may require altering this interpretation.